When you are on one side of town and you need to get across town for a meeting, chances are you don’t really care whether you get picked up by Uber, Lyft or yellow taxi. You just want to get where you need to go safely and quickly. The only other factor that matters is cost. That’s why transportation technology company Gett is trying to carve out a slice of the New York City ride-hailing market by offering a less expensive alternative to its competition. Gett isn’t just another startup either. The parent company of Gett, GetTaxi, which launched in 2010 and is based in Israel, operates in 32 cities on three continents, including London, Liverpool, Manchester and Moscow. Today, Gett announced that its previously announced promotion of $10 flat fare Manhattan rides would be permanent -- well, sort of. That $10 flat fare is good during off-peak times and between Houston Street and Central Park South. On work-day rush hours and weekend nights, the flat fare doubles to $20. For those readers who may not be familiar with Big Apple geography, that’s a good chunk of central Manhattan; a ride with a competitor in that area would likely be over $10. Still, there’s a whole lot of Manhattan outside of that region. Gett is not being subtle about it’s competitive intentions. “Choice is a good thing,” said founder and CEO Shahar Waiserprice in a statement. “In 2015, we want every New Yorker to try Gett.” In offering flat rates, the company is hoping to distinguish itself from frontrunner Uber, which has been criticized for “surge pricing,” or charging amid high demand. 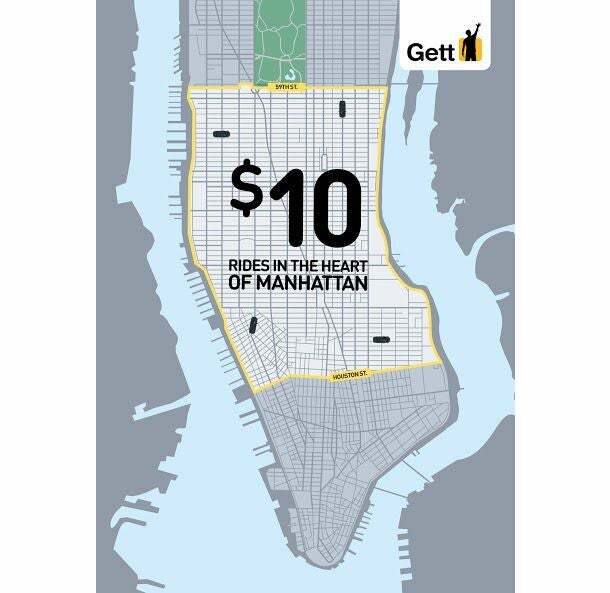 In addition to extending the $10 promotion, Gett announced today that it is cutting it’s fixed pricing by 25 percent across all of New York City. Gett may be dropping prices, but it still has to get consumers to break their routine, download their app and give them a try. And that’s a lot to ask for harried, overscheduled New Yorkers. On top of the “new” factor, six months ago, the average wait time for a Gett car was 18 minutes. That’s a lifetime and a half in New York. Today, Gett says that with 3,000 licensed Gett drivers in New York, it’s average wait time is between five and 10 minutes. There’s no question Gett is still the underdog. And it’s got some formidable competition. Uber is a $40 billion gorilla that can’t be ignored.